I wrote this nearly a month ago, but didn’t get round to posting it, as I wanted to use all the things before I did so. I STILL haven’t tried them all so I’m going to just post it as it was from last month. Apologies it’s so late! 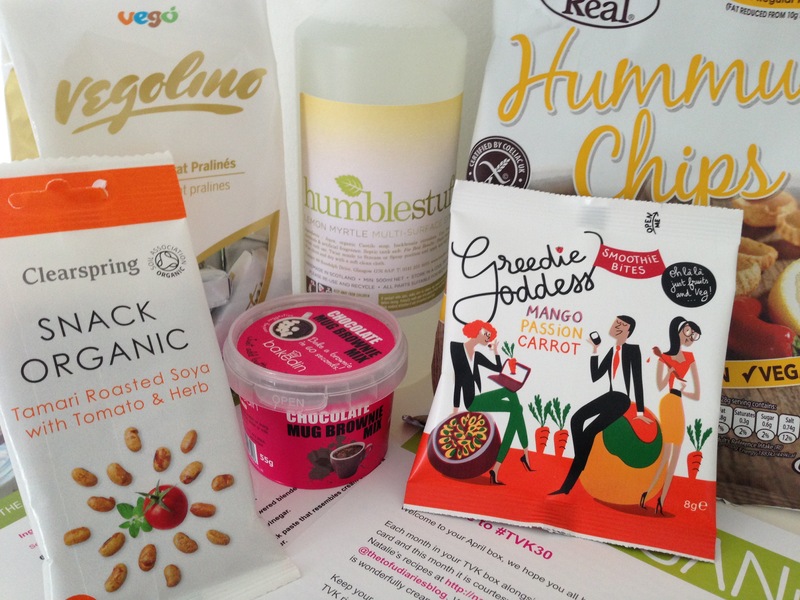 A couple of months ago, I finally got round to subscribing to the monthly vegan box from The Vegan Kind. So far I’m pretty impressed so thought I’d share my thoughts on this month’s box. I’ve heard people talk about Vego bars, but haven’t come across them. It took quite some time for me to click that these are by the same company. This might seem an odd item to get in a monthly vegan box, but I’m so happy it’s in there. I’m looking forward to trying it when our current (Method) kitchen spray runs out. I love these. We get them and their lentilly version from Holland and Barrett fairly regularly. The hummus ones taste a bit like Pom-bears. I love the name of this company! Like the sound of the snack too. I love the idea of mug brownies in that they’re convenient, but I tend to avoid using the microwave as much as I can. That said, I’ll definitely be trying this out when in need of a warm, cakey chocolate fix. These look tasty and I’m always on the lookout for savoury snacks that aren’t massively unhealthy. Pretty sure the company is the one that makes miso soup so that’s a good sign. Every box comes with a recipe card. This month’s is for vegan cream cheese. A donation is made from the cost of every box sold, which is a lovely idea. A different charity is chosen each month. This month the donation is going to Teen VGN. I can’t wait until next month, as not only will there be another monthly box arriving, but there will also be a quarterly beauty box! A word of warning if you are subscribing: if you take up the offer for a past box when you subscribe, do not expect it to be the box from the month before your subscription starts. It took me quite a while to realise that the reason my past boxes (monthly and beauty) were different to the ones I’d seen reviewed that month was that they were in fact boxes from last year. I was actually very pleased, as the boxes had some awesome things in them, but the confusion had me wondering or a while whether it was going to be another box fiasco (more to come on this when I get round to posting about my beauty box experiences). Do you subscribe to any monthly boxes?